Greatness (1-14). A child totally depends on others and must live by faith. An unspoiled child accepts his position in life, enjoys it, and does not try to act like someone older (Ps. 131). “He will be greatest who has the least idea he is great,” wrote A. H. McNeile. The way we treat children (including those who are “children in the faith”) indicates how much humility we practice. Do we receive them (v. 5) or despise them (v. 10)? Do we imitate them (vv. 3-4) or cause them to stumble by our bad example (vv. 6-9)? It was a sheep, not a lamb, that went astray (vv. 10-14)! Truthfulness (15-20). “Speaking the truth in love” (Eph. 4:15) is the secret of maintaining Christian fellowship. The longer we resist, the more people we involve in the problem (Matt. 5:21-26). Humility and honesty must work together in producing harmony. Forgiveness (21-35). Peter wanted a rule to obey, which shows he was not in the spirit of what Jesus taught (Rom. 12:8-10). The parable is not about salvation but about forgiveness among God’s people. We are to forgive others because God has forgiven us (Eph. 4:32; Col. 3:13), and He has forgiven us at great cost to Himself! It is possible to receive forgiveness but not truly experience forgiveness in our hearts; therefore, we have a hard time sharing forgiveness with others. When you have an unforgiving spirit, you put yourself in prison spiritually and emotionally; you pay dearly for the luxury of carrying a grudge. Is it worth it? 1. Pray that you will be passionate about reaching out to the unsaved and that you may grow into discipling young believers. 2. 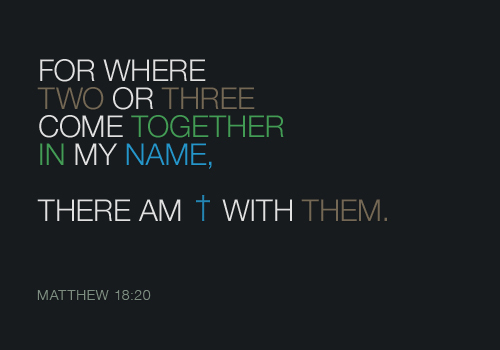 Pray that you will always make every effort to keep good relationship with other believers in the Church. 3. Pray that you will always show mercy and be gracious to other people even as the Lord has shown you. This entry was posted on Saturday, January 19th, 2013 at 6:48 am	and posted in 30 Day Challenge (January 2013). You can follow any responses to this entry through the RSS 2.0 feed.